A new study published in Clinical Cancer Research by researchers from the Abramson Cancer Center at the University of Pennsylvania (ACC) that suggests that noninvasive liquid biopsy tests may be a more effective and suitable alternative to the gold standard tissue biopsy to detect clinically relevant mutations for advanced lung cancer patients and help guide their course of treatment. The UPenn research builds a case for increased clinical use of liquid biopsies to address an unmet need for better, noninvasive tests, as called recently out in the Cancer Moonshot Blue Ribbon Panel Report. 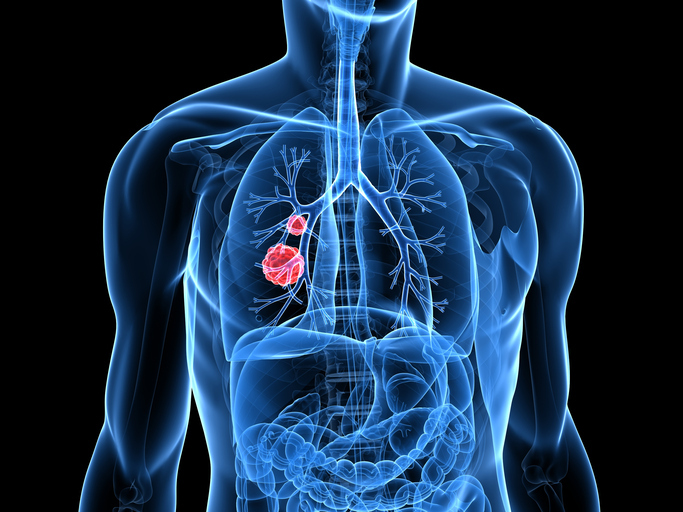 The ACC researchers studied non-small-cell lung cancer (NSCLC) and were able to detect mutations from liquid biopsy blood samples that analyzed cell-free circulating tumor DNA (ctDNA). The scientists found that the mutations picked up by the liquid biopsy samples closely paralleled mutations from tissue biopsies identified using next-generation sequencing (NGS) tests, such as epidermal growth factor receptor (EGFR), tumor protein 53 (TP53), and anaplastic lymphoma kinase (ALK). Moreover, there were several instances where liquid biopsies captured clinically relevant mutations not found in tissue biopsies as patients' disease progressed. Interestingly, about half of the 102 patients in this study did not have sequenceable biopsy tissue, so researchers relied on blood tests to detect mutations. Also, investigators are now seeing the emergence of targetable resistance mutations in advanced NSCLC as the disease progresses and therapies change—which is much more achievable with serial blood samples used for liquid biopsy. In the study, researchers enrolled 102 consecutive patients with advanced NSCLC treated at Penn between February 2015 and March 2016 who had blood samples sent for ctDNA testing as part of their routine clinical care. Most were women (68%) with adenocarcinoma (81%) and Stage IV disease (96%), all with different courses of treatment. “We detected 275 alterations in 45 genes, and at least one alteration in the ctDNA for 86 of 102 patients (84%), with EGFR variants being most common. ctDNA NGS detected 50 driver and 12 resistance mutations, and mutations in 22 additional genes for which experimental therapies, including clinical trials, are available,” the authors added. “While ctDNA NGS was completed for 102 consecutive patients, tissue sequencing was only successful for 50 patients (49%). Among the 50 patients, 41 mutations were detected by both methods, whereas 24 therapeutically targetable driver EGFR mutations (a known driver of lung disease) were detected in tissue samples and 19 in ctDNA samples. Importantly, concordance between the two tests was nearly 100% when the samples were obtained concurrently, with discordance increasing when the blood samples were collected at longer intervals after the tissue sample. Taken together, these data suggest that liquid biopsies for NSCLC patients can yield results with high clinical relevance, including detection of therapeutically targetable mutations in EGFR, ALK, and other genes. The next step is to evaluate the liquid biopsy's utility at diagnosis as a complement to tissue testing and in the context of genetically heterogeneous metastatic disease.